The story of a mom who lost the ability to communicate clearly. 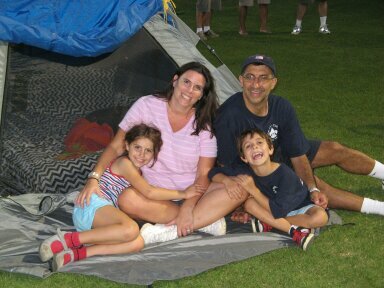 The Kourys at a campout in 2010, seven days before Jackie’s stroke. On July 25, 2010, Paul Koury awoke at 3:15 a.m. to a loud thud. When he got up to see what had happened, he found his wife, Jackie, facedown on the bathroom floor. Jackie had suffered a pulmonary embolism, a blockage in one of the main arteries in the lungs caused by a blood clot. Two days later, in the ICU, the clot traveled up through Jackie&apos;s heart and to her head, causing an ischemic stroke—a blockage in a cerebral artery. 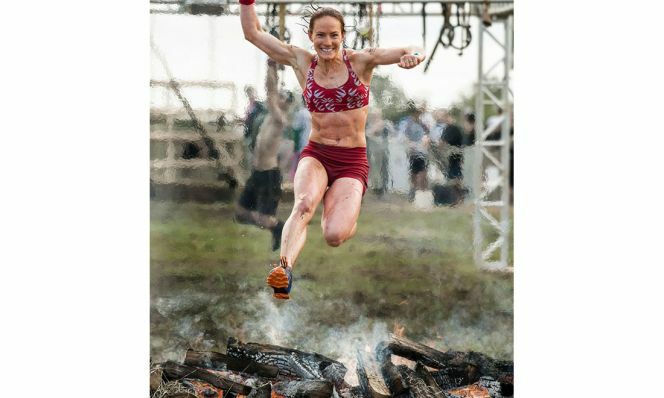 While recovering from brain surgery, Jackie struggled with the loss of function in her right arm (she had to relearn how to write, feed herself and tie her shoes) and right leg (she was confined to a wheelchair for the first year of her recovery). But the most difficult challenge of all was her inability to speak her mind. A few weeks post-stroke, Jackie was diagnosed with aphasia, which is caused by damage to the part of the brain responsible for language. About one million people in the U.S. suffer from aphasia, according to The National Institute on Neurological Disorders and Stroke. The condition leaves them struggling to come up with the words they want to say, substituting an unintended word for another, switching up sounds of words or having difficulty saying full sentences. Aphasia makes it hard to understand what others say too, especially if there's background noise. Jackie was also diagnosed with apraxia, a decreased ability to position the lips, tongue and vocal cords to produce proper sounds. "Thankfully, Jackie had full cognition and she understood that what she was saying would come out as gibberish," explains Paul. "She was frustrated, but she always stayed positive." Jackie says that's because Paul managed to juggle daily visits, taking care of the children, talking to doctors, therapists and nurses and filling Jackie in on her prognosis—all while working full-time. At Kessler Institute for Rehabilitation, where Jackie spent three months after leaving the hospital, her two kids—Rachel, who was 8 at the time, and Jackson, then 6—would visit every Wednesday and on weekends. Rachel would watch how her own mouth, lips and teeth moved in the mirror so she could teach her mom how to re-create certain sounds. Jackie slowly began forming more words, mostly nouns ("we became good at charades," Paul says), and then short sentences. And while the kids were scared and embarrassed of their mom at first, after visits to the Adler Aphasia Center, where they met families going through similar experiences, Rachel and Jackson became more empathetic toward others and closer to Jackie. To this day, Jackie fights to find the words she wants to say, but her entire family describes her as cheerful and someone who can brighten up any room. And because of the extra day-to-day responsibilities the Kourys face, vacations have become a priority. Since Jackie's stroke, they've visited Costa Rica, the Caribbean, Europe and more. As for Paul and Jackie's relationship: "What we miss the most are life's everyday 'little conversations' that people take for granted," they said. "So instead of talking, we just hold hands, knowing a lot is going unsaid. Together with our friends, we redefined what a 'normal' life is and we achieved a life that, in some ways, is better than the one we would have been destined for had Jackie not had a stroke." Jackie's family has also learned to give her time and not interrupt when she's trying to say something. "What I want people to know is that not being able to speak is not the same as having nothing to say," Jackie explains. "Aphasia causes the loss of language, not intellect." Check out the American Speech-Language-Hearing Association and the National Aphasia Association to learn more about this condition. To lower your risk of stroke, the common cause of aphasia, make sure to eat healthy, move more and quit smoking. Also, talk to your doctor about your risk of blood clots to prevent pulmonary embolism, and exercise your leg muscles or wear compression socks if you're going to be sitting for a long time.